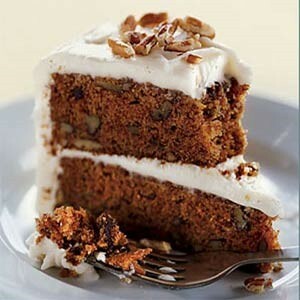 This Chocolate Carrot Cake Recipe makes a beautiful Easter dessert recipe. It's really very nice. In a large mixing bowl combine the butter, milk, eggs, sugars and salt. Then stir in the carrots and nuts. Sift together all the other dry ingredients into the wet ingredients; stir until just combined. Pour into a greased and floured 9 by 13 pan (or pans of your choice). Turn the oven temperature to 350 degrees. Bake for 35 -45 minutes, or until a toothpick inserted comes out clean. Let cool completely on a wire rack. Approximately 1 1/2 hours. Cream together cream cheese and butter. Stir in melted white chocolate and butternut extract. Then sift in the confectioners sugar and nutmeg. Stir until smooth and creamy. Frost the cake and store in an air tight container in the refrigerator. Hope you enjoy this yummy Easter Dessert! Mmmm. Does sound really wonderful, Charla. Thanks for adding this to our Easter dessert recipes. I'm not sure if there should be cocoa in this recipe. It's a chocolate carrot cake because of the white chocolate in the icing.